Many times when having conversations with non-believers they will say that Christians are deluded into believing in something that they cannot see. Likewise, as part of the same conversation, non-believers will often ask in a sarcastic way, “Have you seen God?” For most believers, the comment often leaves them standing there without an answer and the non-believer is left feeling they have won the argument. 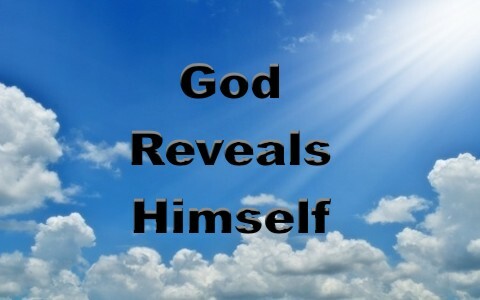 For this reason it is important to know the how to answer how does God reveal Himself to us? However, in Exodus 33:11, the Bible says: “And the LORD spake unto Moses face to face, as a man speaketh unto his friend…” Some will say this is a contradiction in the Bible or use this verse to claim we can see God. The words “face to face” do not mean that Moses could see God’s face. They mean that Moses was talking to God in person. – We see God revealed in His Word and through the leading and directing of the Holy Spirit (Psalms 23:3; Ezekiel 12:25; John 14:26; 2 Corinthians 2:17; 2 Timothy 3:16-17; 1 Thessalonian 1:5. 1 Thessalonians 2:13). When He speaks to us through the Holy Spirit, it is not in a loud audible voice, it is in a small voice that brings Bible passages, thoughts, and ideas to us (1 King 19:1-12; Isaiah 55:6-13; Revelation 5-6). – We see God revealed in the events that we see, hear, and experience. However, in order for us to be able to see God when He reveals Himself to us, we must believe that He is and is a rewarder to those who diligently seek Him (John 11:39-45; John 20:27-31; Hebrews 11:6). Those who do not believe that God is and a is rewarder to those who diligently seek Him, He blinds so that they cannot see Him nor His revelation to their own destruction (Deuteronomy 28:15-29; Matthew 15:10-14; John 12:37-41; Romans 11:7; Romans 11:25; 2 Corinthians 3:12-16; Ephesians 4:17-19; 2 Thessalonians 2:11-12; 2 Peter 1:5-9; 1 John 2:8-11). So, for the non-believer who asks us if we have seen God, we can say not directly, but we see the evidence of Him, which He reveals to those who believe that He is and diligently seek Him. This answer will provide an opening to sharing the Gospel of Jesus Christ. Man cannot see God in his current state as a human that has not attained perfection such that he can stand before God without perishing. Although this does not take place until the believer dies or is raptured so that he is absent from he body, and present with the Lord; the believer can see how God reveals Himself. He sees God’s revelation though His Son Jesus, God’s works, and the good works of His believers. God also reveals Himself through His Word and the leading and directing of the Holy Spirit. The Holy Spirit reveals God through our experiences, Bible passages, thoughts, and ideas that come to mind in certain situations. However, for anyone to see God’s revelation, they must be a believer and diligently seek God. I love Ray Comfort’s street preaching method, when confronted by those who claim they cannot believe in a god they cannot see. Ray asks them to look at a building across the street. He asks them if they can see the builder? When the answer is “no”, he continues and asks them if they believe there was a builder. The answer is inevitably, “yes”. Say Doc, you are so right about Ray Comfort who uses the best and most biblical model for reaching the lost called Hells Best Kept Secret. Another thought is that the creation itself seems to declare and reveal that there is a Creator (Psalm 19:1). God’s power and His divine nature seem to demand it (Rom 1:20) so that it should be very plain to them (Rom 1:19). The creation in essence speaks about their Creator (Psalm 19:2-3) so I really believe, deep down, that they must look at the heavens and the earth and think about where everything came from. The creation is the effect and God is the cause. Aristotle didn’t believe in a personal God but he did call Him the “unmoved mover” because something must have made things go into motion so some force had to have acted upon and create matter in the first place. Even Sir Isaac Newton in his laws of motion, particularly in the First Law, reasoned that an object either remains at rest or continues to move at a constant velocity, unless acted upon by an external force. That force must have been God Himself, the first cause. Amen to you both. Ray Comfort demonstrates how we must always be ready to give an answer for the hope that lives within us. We must take the logic of God’s Word and explain it in ways that make sense. When people see the common sense of what the Bible teaches, it makes sense to them and tills the earth of their hearts to plant the seeds of truth. Clicked “Like” if on Facebook to your comment sir! Amen…hard words soften hearts whereby soft words harden hearts! I was wanting to know if you could explain to me from this message how do you know Gods will for your life, where he wants you, or what his purpose is for you. There are times I sense such a push in the Holy Spirit atleast it seems and is almost undeniable that it’s God, but at the same time how can I distinguish wether it’s God or my own motives. This always seems to confuse me and then there are times when it seems I’m pushing Gods word through my own intentions, I don’t wanna come off as a false prophet or boast by any means. Also there are times I get excited to spread the good news, but when I’m in the midst of people I close up because of my social anxiety and PTSD , I then get overwhelmed and nervous about how to approach someone. Before I go out I have been asking the Holy Spirit to guide me and prepare hearts to receive while putting on the Armor of God to protect against the enemy, but once I step out I start to doubt and get nervous, how can I get past this and have courage in the Holy Spirit to overcome this fleshy weakness. It really bothers me cause I constantly feel compelled to share the Gospel through my walk, there are times I feel like even just throwing myself out there on Faith without worries and just speak Jesus even if I stumble my words. I certainly have the love and heart for it but it’s my words and actions that trip me up or make me unconfident. The only other avenue I have to spread the Good news is through my artwork and creativity which I have done, but I’m not sure if I was spiritually drawn to do it or it came by my own desire even after praying. Plus I don’t know if it reaches others accept fellow believers, but isn’t it just about planting a seed and letting God work. Previous post: What Does The Bible Say About The Power of Words?